Sterly, H, Etzold, B. & S. A. Peth (2019): Bangladesch – Beweggründe für Binnenmigration und translokale Lebensrealitäten , in: Geographische Rundschau 3/2019 (März), p. 18-23. Peth, S. A. (2019): Vom Mensch zum Inputfaktor – Einblicke in das Leben der Arbeitsmigranten in Singapur, in Südostasien 1(2019). Peth, S. A.; Sterly, H. & P. Sakdapolrak (2018): Between the village and the global city: the production and decay of translocal spaces of Thai migrant workers in Singapore. Mobilities, 13, DOI:10.1080/17450101.2018.1449785. Sakdapolrak, P., Naruchaikosol, S., Ober, K., Peth, S. A., Porst, L., Rockenbauch, T., Tolo, V. (2016): Migration in a changing climate. Towards a translocal social resilience approach. DIE ERDE, 147(2), 81-94. Peth, S. A. (2015): Migrationspfade und Arbeitsräume in Bangladesch – Translokale Lebenssicherung in einer sich wandelnden (Um)Welt, TransRe Working Paper No. 4, Department of Geography, University of Bonn, DOI: 10.13140/RG.2.1.1951.9840, Bonn. Hornung, M. & S. A. Peth (2014): Alltag im Hier und Dort – Heiratsmigration und translokale Verflechtungen zwischen Thailand und Deutschland, in Südostasien 4(2014). Steinbrink, M & S. A. Peth (2014): Hier, dort und dazwischen – Translokale Livelihoods in Südafrika, in: Geographische Rundschau 66(11), S.32-38. Tröger et al. (2011): Failing Seasons, Ailing Societies – Climate Change and the Meaning of Adaptation in Ethiopia, Addis Ababa. Peth, S. A. (2018): Transnational Labour Migration and Lost Remittances in South East Asia: Thai Migrant Workers Returning Home, Rural Futures Southeast Asia Conference – ruralSEA, Bangkok, 01.-02.08.2018. Peth, S. A. (2017): Strukturelle Segregation und Translokalität thailändischer Arbeitsmigranten in Singapur, Congress: DKG 2017 – Geographentag, Tübingen, 30.09.-05.10.2017. Peth, S. A. (2017): „Good (wo)men take care“. The gendered mobility and translocal embeddedness of migrants in-between Thailand and Germany, Conference: EuroSEAS 2017, Oxford, 16-18.08.2017. Peth, S. A. (2017): Strukturelle Segregation und die Vergänglichkeit translokaler Orte Thailändischer Arbeitsmigranten in der Global City Singapur, Conference: AK Geogr. Stadtforschung im Entwicklungskontext, Cologne, 08-09.07.2017. Peth, S. A. (2016): Living between the village and the global city: Translocal connections and social resilience of Thai migrant workers in Singapore, Workshop: Connecting the Dots, Bonn, 29.09.2016. Peth, S. A. (2013): Lost in space and fluidity? Gedanken zu den Herausforderungen translokaler Geographien, Workshop: Grundfragen geographischen Arbeitens, Bayreuth, 22.11.2013. Peth, S. A. (2013): Arbeit im System: Migration und translokale Lebenssicherung in Bangladesch, Deutscher Geographentag 2013, Passau, 22.11.2013. Peth, S. A. (2013): Doppelt sesshaft oder völlig losgelöst? Arbeitsmigration, Translokalität und soziale Einbettung im ländlichen Bangladesch, Deutscher Geographentag 2013, Passau, 22.11.2013. Peth, S. A. (2018) “We are trained like soldiers” The inhumane mechanisms of international labor migration and its impact on translocal connectedness. Blog: Connecting the spots – Notes on migration and environment from a geographical perspective, May. 2018. Peth, S. A. (2016) “I will never return.” The drudgery of Thai farm workers in Israel Blog: Connecting the spots – Notes on migration and environment from a geographical perspective, Dec. 2016. Peth, S. A. 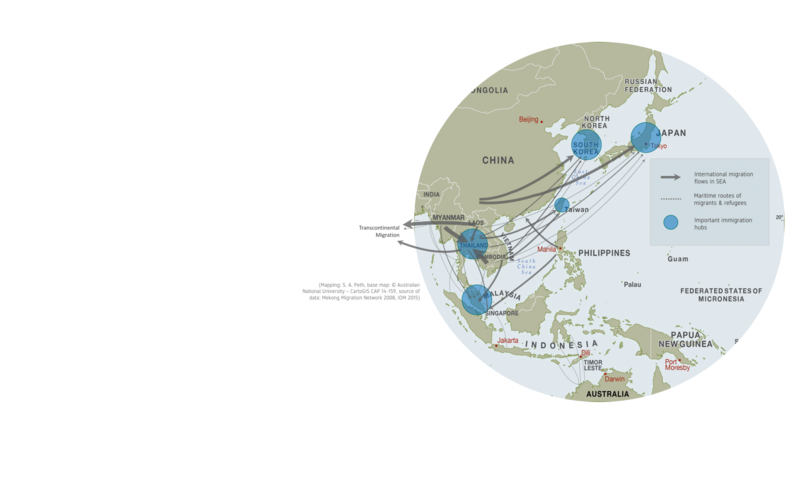 (2016): New connectedness of people on the move, Blog: Migration Systems, Aug. 2016. Peth, S. A. (2015) Bangladesh: Prime Example of Climate Migration? Blog: Connecting the spots – Notes on migration and environment from a geographical perspective, Oct. 2015. Peth, S. A. (2015) „I call several times per day.“ How new communication tools shape the connectedness of people on the move. , Blog: Connecting the spots – Notes on migration and environment from a geographical perspective, Jul. 2015. Peth, S. A. (2015) From Science to Action, through Co-Production of Knowledge [VIDEO BLOG], Blog: Connecting the spots – Notes on migration and environment from a geographical perspective, May 2015. Peth, S. A. (2015) Are we all translocal now? Blog: Connecting the spots – Notes on migration and environment from a geographical perspective, Feb. 2015. Peth, S. A. (2014) What is translocality? A refined understanding of place and space in a globalized world, Blog: Connecting the spots – Notes on migration and environment from a geographical perspective, Nov. 2014. Peth, S. A. & C. Sefrin (2008) Wax and Gold – Äthiopien ein Land auf dem Weg in die Zukunft.